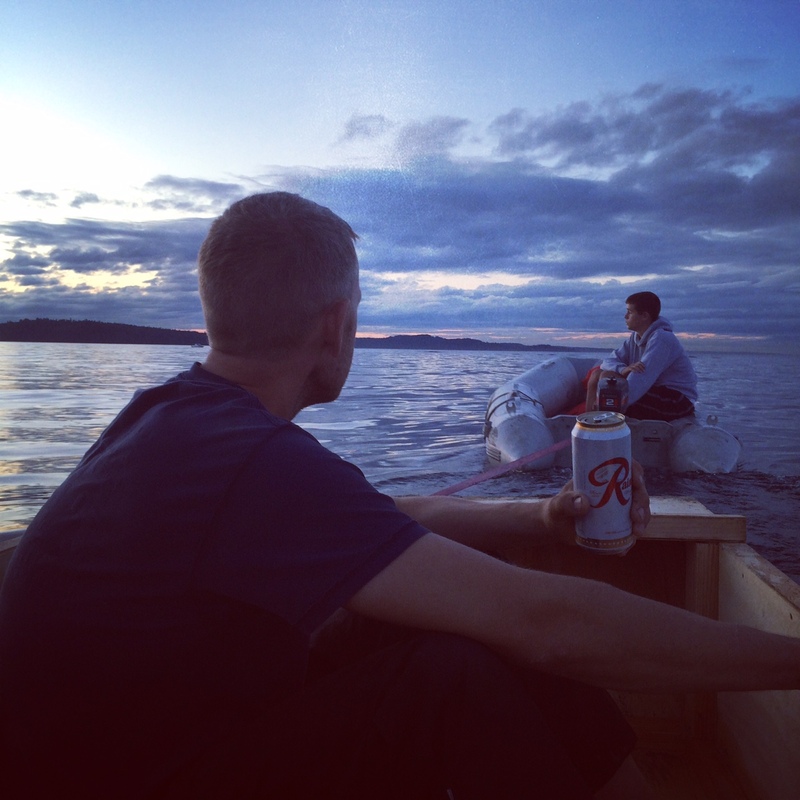 My son, Carter, sat perched on the edge of the Zodiac driving the outboard as he towed Jim and me in Jim’s hand-built plywood barge for a trip around the point to see the sunset. Carter’s jaw was set in a way his father’s used to when Arron was being “Mr. Big Pants,” the name I gave him when he was feeling super-confident and a little smug as he trotted off to work in his expensive Hugo Boss suit. Carter’s smugness came from a day filled with man-stuff, activities that only my boyfriend Jim could make possible. My son is at the 15-year-old boy stage of hiding in his room, grunting replies to questions, sleeping until 2 p.m. and racking up hundreds of dollars a month in junk food. The fact that he joined Jim and me on a weekend excursion to our house on Vashon Island is astonishing, and Jim pulled out every trick he had to make the weekend exciting to a teenager hooked on Internet crack. In one day, Jim provided Carter with gun lessons, patiently explaining their safe handling and then schooling him in the meticulous art of their cleaning; let Carter drive the Zodiac as they dropped a crab trap and shot off Jim’s .45 a few times across the Sound; allowed Carter to practice driving his beat-up Mercedes station wagon up and down the steep, winding road to and from the house; set up a shoe box so Carter could shoot holes in it with Jim’s air gun; wrestled Carter to the kitchen floor several times; and finally, let him tow us in the barge to see the sunset. As I watched Carter drive the boat, I could see that in one day he had grown into a man. He exuded a confidence I swear had not been there the day before. As he grows and takes on more and more characteristics of his dad, I find myself wondering how our lives might have been different had Arron not gone to that trade show at Windows on the World. What would it have been like for Carter, who was 2 when his dad died, to grow up with his father? Would they have fought? Would they have been close? Would Carter be more or less self-possessed? Would he have been better disciplined? Yes, we are resilient. I suppose it makes sense then, that for me, the anniversary of 9/11 has become a moment when I am reminded to look at that resiliency firsthand. It’s a moment for me to take stock. Only a few weeks before, my daughter, a second-year college student who was 6 when her dad died, came to me with an essay that she wrote in her bid to transfer into The University of Pennsylvania’s Criminology program. As a high school student, I could barely get her to do her homework and hand it in, and here she was presenting me with an intelligently written essay about why she wanted to study criminology. Written over the summer. On her own time. Without my help. I suppose I shouldn’t be surprised that criminology has become her passion. The twists and turns that tragedy takes as it flows through growing children can never be predicted, except when in an odd way it makes perfect sense. As I read, she sat on the stairs behind me, her arms hugging her slim brown legs, looking both like a little girl and a grown woman at once. When I finished reading it, I turned to her. “It’s really amazing, but there’s just one thing,” I said. She bounced down the stairs and stood over me. She smiled. “Yeah, I guess you’re right,” she said as she tied her hair into a high ponytail, grabbed her purse and headed out the door to the gym. I was struck suddenly by how strong she looked, both physically and mentally. Another 9/11 anniversary is upon us, and I can’t decide how I feel about it. The truth is, I feel nothing. Dread perhaps, if anything. The day an unwanted spotlight shines upon us, in ways mostly good — filled with well-wishing "thinking of you" emails and phone calls from people I love to hear from and catch up with — but uncomfortable as well. I feel obligated to write or respond to each one, “Thank you for your thoughts … ” when my instinct is to curl up and hide from all the odd attention. I love that people think of me, I’m just not all that thrilled with why they think of me. 9/11 is such a giant weight to bear. I keep searching for ways of making it bearable, or to give it a positive spin, which in some ways is easy, in other ways impossible. It seems after large-scale tragic events, there is an overwhelming desire to find someone responsible, to seek the whys, the should haves, the could haves. Reform is demanded and sometimes implemented, but rarely are the changes effective. We take off our shoes to board airplanes, we killed Osama, we’re no longer fighting a war in Afghanistan, so therefore we must be safer, right? Since, you know, we’ve wiped out terrorism and all. As a firefighter, Jim often says he is safer at work than he is at home due to all the rules and safety regulations in place to protect firefighters' lives. His station is near a river that people occasionally drive into, but because the firefighters are required to wear life jackets during water rescues, they are often forced to watch helplessly as someone drowns because, with life jackets on, they are unable to dive under the water and rescue them. I can only imagine the fire safety requirements implemented in the wake of 9/11. I have an entire book gathering dust on my bookshelf devoted to all the changes that America was committed to making as a result of the 9/11 Commission’s recommendations. Streamlining the CIA, shutting down the financial sources of terrorist groups, a unified national emergency response unit, federally standardized birth certificates and driver’s licenses, setting up a “Youth Opportunity Fund” to better educate Muslim youth, better managing our borders — to name but a few. We certainly implemented a regimented airport security system, but it seems some of the other recommendations have been commandeered for different purposes. Suddenly, “better managing our borders” is a hot political issue and has slid into the realm of immigration control. Immigration control, gun control, the justification for invading countries are cloaked in that “war on terror” cover story and thus we wind up deluding ourselves that we are safer now than we were then. The world seems impervious to the lessons we were supposed to have learned from 9/11. The war over Palestine/Israeli territory continues to wipe out thousands; planes are shot from Ukrainian skies; journalists' heads are lopped off in Middle Eastern deserts; mentally ill people walk into to schools with guns and open fire; unarmed boys are shot dead by the people meant to protect them. The crappy stuff keeps happening. Countless lives are turned upside down on a daily basis, leaving kids to grow up without fathers and mothers and parents who will not see their children become adults. The anniversary of 9/11 seems like a day to be reminded that crappy stuff still happens, despite all the so-called safeguards and changes we make to prevent it from ever happening again. No wonder I have a hard time being remembered for it. Maybe then, to give 9/11 a more positive spin, the lesson should be that despite such tragedies, fatherless 15-year-old boys still manage to grow up to become confident men, to learn the art of acting like “Mr. Big Pants,” to look and act just like the fathers they never knew. Daughters who muddled through high school can suddenly shine in college and discover their strength as they try to find meaning in their pasts. Maybe that’s too simplistic: Crappy stuff happens, but we all still grow up regardless of our circumstances. Yes, we are resilient. I suppose it makes sense then, that for me, the anniversary of 9/11 has become a moment when I am reminded to look at that resiliency firsthand. It’s a moment for me to take stock: to notice the confident set of my son’s jaw, to marvel at my daughter’s strong legs and awe-inspiring essay. This morning, Jim and I pulled up the crab trap and found a crab too small and too female to keep. We brought it to Carter’s room where he was just waking up (it was 1 p.m., after all) and Jim held it, legs wiggling, over the bed. Carter giggled his dad’s giggle. After the crab’s little adventure to the bedroom, we set her back on the beach and watched her crawl sideways back into the water and shuffle away, thankful, no doubt, and perhaps a little wiser. Abigail Carter wrote The Alchemy of Loss: A Young Widow’s Transformation as a form of catharsis after her husband’s death in the World Trade Center on September 11, 2001. She has also self-published a novel, Remember the Moon. Find more of her work at www.abigailcarter.com.